July 15, 2013 – MRA Poolside Reception – The Colonnade Hotel, Boston. July 19, 2013 – MLA Outlook 2014, Sheraton Boston Hotel, Boston. Everybody has a name for their restaurant, hotel or store. Any name that represents goods or services and functions as a source identifier is a trademark (or service mark). But does every trademark need to be registered? And why do we need to register marks, anyway? It is a bit confusing because although federal Trademark Law provides for a registration system, it also provides what are called “common law” rights – rights for mark owners who do not register. These rights are based on use in commerce and seniority. Businesses in the hospitality industries, restaurants in particular, may be thought of as essentially local, so nationwide rights may seem like overkill. So why should one register? What are the advantages and how will you know when you should register? The main reason you would apply for federal registration is to assist you if enforcement is a concern or issue. Your business is in a major city with many tourists and travelers and has gained popularity, notoriety, or publicity. Out-of-state visitors could be confused if they come across a similar business with the same or a similar name. You have a unique concept that may make the concept and perhaps the mark, also, more at risk for copying. Your mark is very unique (the best kind!). If so, there might be a greater chance of confusion if someone elsewhere comes up with the same or a similar mark, either through copying or the “great minds think alike” situation. Your business is expanding, and you want to make sure that if you want to open a site in Chicago or Virginia or Las Vegas, that you have the right to do so. If your business is expanding into another country, then you will need to register in that country, which is easier to do if you hold a U.S. registration. Click here to read full article. Product contamination. A controversial remark by a top executive. A disgruntled former employee with an axe to grind. The potential for bad press for your restaurant, retail store or hotel is everywhere, regardless of how tight a ship you run. The critical question is not if a crisis can happen to your business; it’s what do you do when it happens. Here are three basic rules that every company can follow to help minimize negative publicity, preserve its reputation, and limit exposure to potential legal claims. 1. Take the call. By the time you receive a call from a reporter, the story likely is already out there. Answer the call, but ask questions to learn as much as possible about the scope and angle of the story. Don’t Wing It! Think. Deliberate. Know what you’re going to say before you say it, and be prepared for follow-ups. Be honest. If you don’t have an answer or do not know how to answer a question, then say so. Something like: “I don’t know, but I’m going to find out and will get back to you.” Click here to read full article. Putting the ‘Custom’ Back in Customer. Attending the Peter Pan show at The Wang Theater a few weeks back, and watching Kathy Rigby flipping and flying around the stage reminded me of the importance of flexibility. So too with restaurants and your customers. While you can’t customize a menu for each and every diner, ‘have it your way’ should be more than just a catchy slogan. Showing some flexibility creates good experiences, builds relationships and customer loyalty. Mussels are on the menu with a red sauce but the customer wants garlic and oil… Why not? Oysters are offered as a dozen but customer only wants six… absolutely! Particularly if it’s not busy and/or the request can be easily accommodated. Even an occasional ‘off menu’ request, if the items are readily available. “Sure” and “no problem” are music to every diner’s ears. RIW client Cafco Construction Management was honored recently at the Boston Business Journal’s Best Places to Work event. RIW clients announce new restaurant locations: Jake N Joe’s has opened a location in Foxboro, and The Lincoln Tavern and Restaurant and The Stockyard have opened locations in Boston. RIW and the National Retail Tenants Association presented “Fighting the Battle of Occupancy Cost Overcharges for Office and Retail Tenants: Identifying, Negotiating and Legal Defenses” on June 19, 2013 at Anthem. 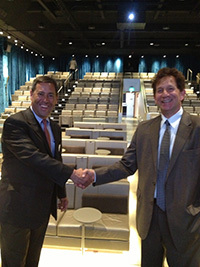 Kelly Caralis and David Robinson of RIW were presenters at the event. RIW’s Steve Feldman and Howie Altholtz attended the Downtown North Association’s recent Annual Meeting. The meeting featured Mayor Menino, and an update on plans for the redevelopment of the former Boston Garden site. 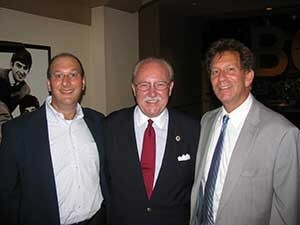 Pictured here are Howie and Steve with DNA Executive Director Bob O’Brien. 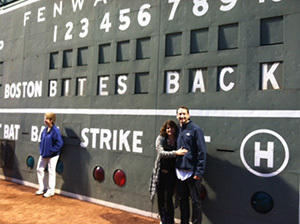 Russ Stein pictured here with Rebecca Stein, attended along with several other RIW attorneys, the Boston Bites Back event at Fenway Park on May 15, 2013. The 21st Annual Restaurant Trends Seminar took place on Tuesday, May 7, 2013 at the Revere Hotel in Boston. RIW and co-sponsors: Cafco Construction; The Boston Restaurant Group; and USI are pleased to announce a portion of the proceeds was donated to the Future Chefs organization. 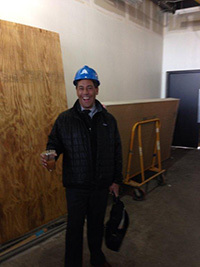 Lou Katz on location at client’s new restaurant project in the emerging Boston Innovation area. 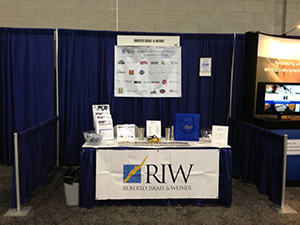 RIW hosted a booth at the 2013 New England Food Show. We appreciate the many that stopped by. Congratulations to Michael Colomba, owner of Crescent Suites Hotel in Waltham, who was the winner of the Red Sox ticket raffle.